COLORADO SPRINGS, Colo. - Junior forward C.J. Smith (Des Moines, Iowa) scored a game-high two goals to lead the No. 7 UMass Lowell Hockey team to a 4-0 victory and a series sweep against Colorado College in non-conference play on Saturday night at the Broadmoor World Arena in the series finale. With the win, UMass Lowell improves to 2-0-2 and the Tigers drop to 1-3-0 overall. Senior defenseman Dylan Zink (Madison, Wis.) extended UMass Lowell's lead to 3-0 with second tally of the season with just 5:33 left in the second period. Freshman Mattias Goransson added his third of the year to give the River Hawks a 4-0 lead on an extra attacker goal at 16:45 of the middle stanza. Smith scored goals at 2:14 and 15:45 to give the River Hawks 2-0 lead at the end of the first period. 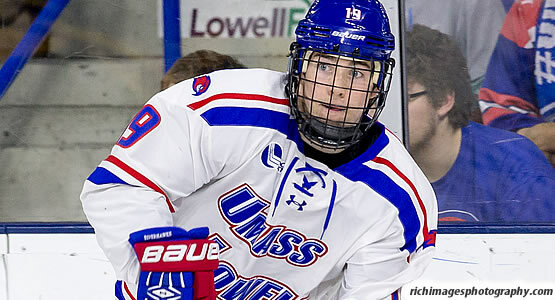 It marked Smith's seventh career two-goal game as a River Hawk. UMass Lowell held a 10-9 shot advantage at the end of the opening period. Freshman goaltender Tyler Wall (Leamington, Ont.) made his second career start for the River Hawks, posting 29 saves in his first career shutout and second career win, which included 11 saves in the second frame. Alex Leclerc posted 13 stops for the Tigers in the losing effort in the first 40 minutes and was relieved by Derek Shatzer stopping nine shots in the third period. UMass Lowell finished the night 2-for-6 on the power play and a perfect 6-for-6 on the penalty kill. Senior forward Evan Campbell (Port Coquitlam, B.C.) led the River Hawks in the faceoff circle, winning 9 of 12 faceoffs (75%) in the win vs. the Tigers. UMass Lowell returns to action on Friday, October 21st against ECAC foe St. Lawrence on Homecoming Weekend. Game time from the Tsongas Center is 7:15 p.m.